A gaming computer requires a nice monitor in order to fully enjoy the latest games. Throughout the years, computer monitors have undergone numerous improvements. The glory days of the big and heavy cathode ray tube (CRT) monitors have passed and have been replaced by the much better LCD and LED design. Computer monitors have become much easier on the eyes, more energy efficient, and very light weight. This article will explain the several different technologies available and offer some insight as to which is the best for the price. Both LCD and LED feature a widescreen display, which are wider than they are tall. These are essentially mimicking that of a movie theater screen. Great for watching movies, widescreen displays are also excellent for playing games. Just simply adjust your game settings for a widescreen resolution setting and you'll wonder what you've been missing all these years. It is worth noting that both LED and LCD monitors have a native resolution that they are designed to display. The native resolution is the best image they can produce. You simply cannot run an LED or LCD monitor at a lower resolution than it's native resolution. We recommend buying a monitor with the highest native resolution possible. This ensures the best image for your gaming experience. The real drawback of using an LCD monitor is their viewing angle. It is not as wide as the older CRT technology. Essentially, the viewing angle is the widest angle you can be from the front of the screen and still see an image that is not blurry or fuzzy. For a computer monitor, the wider the viewing angle the better the monitor. The viewing angle has even greater importance for televisions that use LCD technology. The television needs to be oriented in such a way that everyone watching it sees a good image whereas with a LCD computer monitor, you are sitting directly in front of it so the angle is not as important. The liquid crystal display (LCD) monitor is very prominent in the marketplace today and rightfully so. It is a major improvement over the CRT technology in several ways. 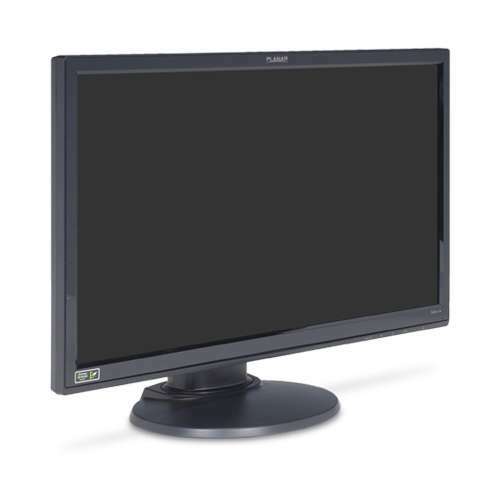 First, LCD monitors use far less energy to produce the image on the screen. In the modern, energy conscious world, the LCD technology was welcomed with open arms over the older, power hungry CRT monitors. Also, LCD monitors are capable of producing a very high resolution. They can show an image in the 1920 by 1080 pixel setting (also called 1080p). In the world of computer gaming, even the difference between 1024 by 768 and 1400 by 900 resolutions is staggering. If you view a CRT and LCD monitor side by side, the difference is abundantly clear. All factors considered, LCD monitors have had a tremendous impact on the computer industry. LCDs currently square off against the latest development in monitor technology, the light emitting diode (LED) monitor. LED monitors are the latest innovation for computer monitors. They further improve upon the energy efficiency concept that LCD monitors begin. They also have a better contrast ratio, which is the difference between the brightest and darkest colors the screen can display. The higher the contrast ratio, the better the monitor. It is worth noting that LED monitors generally cost a bit more than their LCD counterparts. However, their costs continue to decrease over time. LED monitors, like LCDs, also have a native resolution, be mindful of this as you shop. For a great gaming computer monitor, check out the Asus VX238H 23" Class Widescreen LED Monitor. There are several brand names that currently dominate the market for LED and LCD monitors. Samsung, Acer, and Asus each make excellent computer monitors. It is important to know what features are most appealing to you as you shop. Whether you elect to go for a LCD or LED monitor, either one is a great choice. Featuring the latest technology and the best visual display, make the jump to LCD or LED monitor if you haven't already. Be sure to check out www.TigerDirect.com for a great selection on a Gaming Computer Monitor.